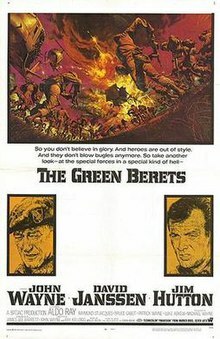 The Green Berets is a 1968 American war film set in Vietnam featuring John Wayne, Jim Hutton, David Janssen, Aldo Ray, Patrick Wayne, and Jack Soo, based on the 1965 novel by Robin Moore. Much of the film was shot in the summer of 1967. Parts of the screenplay bear little relation to the novel, although the portion in which a woman seduces a North Vietnamese communist general and sets him up to be kidnapped by Americans is from the book. Thematically, The Green Berets is strongly anti-communist and pro-Saigon. It was released at the height of American involvement in the Vietnam War, the same year as the Tet Offensive against the largest cities in South Vietnam. John Wayne, concerned by the anti-war atmosphere in the United States, wanted to make this film to present the pro-military position. He requested and obtained full military cooperation and materiel from 36th President Lyndon B. Johnson and the United States Department of Defense. To please The Pentagon, who were attempting to prosecute author Robin Moore for revealing classified information, Wayne bought Moore out for $35,000 and 5% of undefined profits of the film. The film was a critical failure, but succeeded financially. At Fort Bragg, North Carolina, cynical newspaper reporter George Beckworth (David Janssen) attends a Special Forces briefing about the American military involvement in the war in Vietnam. The briefing includes a demonstration and explanation of the whys and wherefores of participating in the Vietnam War. The civilians and journalists are told that international Communism is what the U.S. is fighting in Vietnam. Proof: weapons and equipment, captured from North Vietnamese soldiers and Viet Cong (VC) guerrillas, manufactured in the Soviet Union, Communist Czechoslovakia, and Communist China. Despite this, Beckworth remains skeptical about the value of intervening in Vietnam's civil war. When asked by Green Beret Colonel Mike Kirby (John Wayne) if he had ever been to Southeast Asia, Beckworth replies that he had not. Realizing his ignorance, Beckworth decides to go in-country to report on what he finds there. Colonel Kirby is posted to South Vietnam with two handpicked A-Teams of Special Forces troopers. One A-Team is to replace a team at a base camp nicknamed "Dodge City" working with South Vietnamese and Montagnard soldiers, while the other A-Team is to form a counterguerrilla MIKE Force. While selecting his teams, Kirby intercepts Spc. Petersen (Jim Hutton) from another unit who is appropriating supplies from Kirby's supply depot. Realizing Petersen's skills, Kirby promotes him and brings him onto his SF team. The A team includes: Captain MacDaniel, (Edward Faulkner), a replacement for Captain Coleman; Lieutenants Sachs, (Frank Koomen), and Moore, a Savoy 8 team leader; Master Sergeant Muldoon (Aldo Ray) the senior NCO; Sergeant First Class "Doc" McGee, (Raymond St. Jacques) the team's medical sergeant; Sergeant First Class Kowalski, (Mike Henry) the team's communications specialist; Sergeant Provo, (Luke Askew) the team's heavy weapons specialist; Sergeant Watson, (Eddy Donno) the team's mortarman; and Sergeant Parks, (Rudy Robbins), a man from the Southern United States. Arriving in South Vietnam, they meet Beckworth, whom Kirby allows to accompany them to the fire-base camp. There, he witnesses the humanitarian aspect (irrigation ditches, bandages, candy for children) of the Special Forces mission. Still, he remains unconvinced of America's need to be in Vietnam. During this period, Petersen befriends a young native boy named Ham Chuck (Craig Jue), a war orphan who has no family other than his pet dog and the soldiers at the base camp. Also introduced is the Army of the Republic of Vietnam (ARVN) base camp strike force leader, Captain Nghiem (George Takei), who was a Việt Minh officer from Hanoi during the previous war of liberation from the French colonists, and is now fighting for the anti-communist Republic of Vietnam / South Vietnamese government. He is obsessed with having to "kill all the stinking Viet Cong" to win this war. He also claims that there is a spy network within the camp and ARVN strike force. During Captain Coleman's (Jason Evers) final night at the camp, he spends some time in the team house writing a letter announcing his return home. Coleman instructs the men to check their guard duty rosters before they turn in to rest. He bids everyone good night and returns to his sleeping quarters. Not long afterwards, the camp is hit with Viet Cong mortars. The mortar fire strikes the dispensary, communication bunker, and the team house before it suddenly stops. Coleman is found dead by Sergeant Provo. After Coleman's death, MacDaniel informs Colonel Kirby of his demise. Shortly after this attack, while supervising a group of United States Navy Seabees clearing part of the jungle around the base camp and evacuating the civilians in preparation for a potential Viet Cong attack, Sergeant Muldoon notices an ARVN soldier pacing out distances in the camp and knocks him out. When Captain Nghiem interrogates him, he discovers a silver Zippo lighter in the ARVN soldier's possession. The lighter belonged to a Green Beret medical specialist, a friend of Kirby's, recently murdered by the Viet Cong. After Beckworth sees Nghiem torture the Viet Cong suspect to get a confession from him, he confronts Kirby about it. The Colonel justifies the interrogation by telling Beckworth about the cigarette lighter, and says the Viet Cong are ruthless killers who deserve no legal protections of any sort in this new kind of war. A few days later, Beckworth accompanies Kirby and his team on a patrol in the nearby mountains. Beckworth witnesses the aftermath of a Viet Cong terror attack on a Montagnard village. The young granddaughter of the village chief he had befriended earlier, as well as the chief and most of the male villagers, have been tortured and executed by the Viet Cong for cooperating with the Americans. The next night, the Special Forces camp is subjected to a human wave attack by thousands of Viet Cong and North Vietnamese troops. Kirby and Muldoon, flying back to Camp Dodge City after a briefing in Saigon concerning an upcoming mission, are shot down by enemy fire, They form a defensive perimeter and secure a field to use as a landing zone (LZ) for a MIKE Force flying in to aid the besieged camp. Meanwhile, the ferocious attack upon the Special Forces camp continues relentlessly. Beckworth is forced to take a rifle from a fallen ARVN sergeant and fight alongside the Green Berets. He also helps move the local villagers into the camp to protect them from the enemy onslaught. As the battle rages, Ham Chuck's pet dog is killed and the young boy tearfully buries his faithful companion. Symbolically, the boy uses the stick he had used to dig the dog's grave as the tombstone. He is found by Sergeant Petersen, who takes him to safety with the other refugees. As ARVN soldiers rush to their defensive positions, the stick is knocked away, leaving an unmarked grave. The perimeter is breached by enemy sappers who blow openings in the barbed wire fences around the camp. The Green Berets and ARVN soldiers are forced to fall back to the inner perimeter. Lieutenant Sachs, Sergeant Sooby, and many others are killed. Captain MacDaniel, (Seabee) Lieutenant Jamison (Patrick Wayne), Sergeant Griffin (Chuck Roberson), and Parks are wounded, but not critically. Sergeant Provo is mortally wounded by double agents posing as South Vietnamese soldiers. As his dying act, Captain Nghiem sets off hidden explosives which kill the double agents. Kirby and Muldoon arrive with the Mike Force reinforcements, supported by a U.S. Air Force airstrike in which Douglas A-1 Skyraiders drop napalm on the attacking enemy troops with little success. By dawn, with the enemy attack still continuing Colonel Kirby orders the troops to fall back and withdraw from the camp, which is then taken by the enemy. At a nearby LZ, more U.S. Army helicopters arrive to evacuate the refugees. Petersen puts Ham Chuck on one and promises to return for him in Da Nang. With the base in enemy hands, Kirby orders an airstrike by "Puff the Magic Dragon" (a Douglas AC-47 Spooky armed with three M61 Vulcan miniguns), which kills the occupying VC and NVA troops. With the enemy dead or fled, Kirby and his team re-occupy the destroyed camp and fire-base. Afterwards, Kirby has a talk with Beckworth, during which the reporter admits that he probably will be fired for filing a story supporting United States involvement in the war. He thanks Kirby for the experience and returns to Da Nang with the Mike Force reinforcements. Provo, dying of his wounds, asks Kirby to make his memorial the Provo Privy. The colonel sees to it when he returns to the main base near the capital of Saigon. Back at headquarters, Kirby meets with his superior, Colonel Morgan (Bruce Cabot), as well as Kirby's ARVN counterpart, Colonel Cai (Jack Soo). He is told about a top secret mission they have been planning. The goal is to kidnap a very important North Vietnamese field commander named General Pha Son Ti in North Vietnam. The capture of General Ti is seen as a bargaining chip to end the war on South Vietnam's terms, as well as disrupting the leadership of the Viet Cong. Colonel Cai uses his sister-in-law, a top Vietnamese/French fashion model named Lin, as a honey trap to lure General Ti to a former French colonial mansion in a well-guarded valley in North Vietnam. Kirby, Muldoon, Peterson, and a handful of Green Berets, Montagnards, and ARVN soldiers are selected for this secret mission by Cai, who will be accompanying them. They are airlifted in a Lockheed C-130 Hercules transport plane and parachuted into the North Vietnamese jungle. Muldoon, medical specialist Doc McGee, and two of Cai's men stay behind at a local bridge over a river to set explosives to blow it up to stop pursuit by the NVA forces as the team exfiltrates with General Ti. Kirby and the group arrive outside the guarded plantation where they witness the enemy general arrive at his plantation with Lin. After all the sentries around the mansion are killed, they quietly enter, subdue the enemy general with Lin's help, and hoist him outside, where they put him in the trunk of his French Citroën sedan car. Kirby, Cai, Petersen, Watson, and Lin drive away, but the rest of the team is killed by North Vietnamese guards while attempting to escape. At dawn, the survivors cross the bridge which McGee and Muldoon rigged with explosives. The bridge is destroyed, but Doc McGee is seriously wounded as he and Muldoon escape. The survivors of the raid successfully airlift the captured General out of the area by a Skyhook device mounted to a C-130 Hercules with specially trained pilots. While Kirby and the group advance through the jungle to the LZ where helicopters will pick them up, Petersen is killed by an enemy booby-trap. Kirby and his team are forced to leave his body behind. Back at Da Nang Air Force Base, Beckworth watches as Ham Chuck awaits the return of the helicopters. He realizes the toll of war as Ham Chuck runs crying from helicopter to helicopter, searching for Petersen. Beckworth then falls in with a group of U.S. soldiers who have just arrived by helicopters from another mission in-country. Kirby, in a touching moment, walks over to the boy and tells him of Peterson's death. A teary-eyed Ham Chuck asks plaintively, "What will happen to me now?" Kirby places Petersen's green beret on him and says, "You let me worry about that, Green Beret. You're what this thing's all about." Holding hands, the two walk along the beach into the sunset as "Ballad of the Green Berets" plays. Columbia Pictures, having bought the book's pre-publication film rights, was not able to produce a script that the Army would approve, while producer David L. Wolper, who also tried to buy the same rights, could not obtain financing to make the movie. A screenplay was written by George Goodman who had served with the Special Forces in the 1950s as a military intelligence officer and had written a 1961 article about the Special Forces called The Unconventional Warriors in Esquire magazine. Columbia sent Goodman to South Vietnam for research. Robin Moore felt the Pentagon pressured Wolper into breaking an agreement with Moore. Wolper acquired the rights to film The Devil's Brigade, an account of the World War II 1st Special Service Force in 1965, and produced that film instead. The final film's origins began in June 1966 with a trip by John Wayne to South Vietnam, and his subsequent decision to produce a film about the Army special forces deployed there as a tribute to them. Wayne was a steadfast supporter of American involvement in the war in Vietnam. He co-directed the film, and turned down the "Major Reisman" role in The Dirty Dozen to do so. Although The Green Berets portrays the Vietcong and North Vietnamese Army as sadistic tyrants, it also depicts them as a capable and highly motivated enemy. The film shows the war as one with no front lines, meaning that the enemy can show up and attack at almost any position, anywhere. It shows the sophisticated spy ring of the VC and NVA that provided information about their adversaries. Like A Yank in Viet-Nam, it gave a positive view of South Vietnam and their anti-communist allies. The US Army had objections to James Lee Barrett's initial script. The first was that the Army wanted to show that South Vietnamese soldiers were involved in defending the base camp. That was rectified. The Army also objected to the portrayal of the raid where they kidnap a NVA general because in the original script this involved crossing the border into North Vietnam. Robin Moore has stated that while all of the other stories in his book are roman a clefs of actual Special Forces missions and incidents, the mission to capture General Ti was completely fictitious. Wayne wished the screenplay to have more development of the characters, but Warner Bros. made it clear they wanted more action and less talk, as The Alamo was heavily criticized for having too much dialogue. Scenes shot with Vera Miles as the wife of Wayne's character were jettisoned. (However, Miles was again cast as the Duke's wife in Wayne's next film Hellfighters). Much of the film was shot in the summer of 1967 (before the Tet Offensive) at Fort Benning, Georgia. Department of Defense cooperation with the film was extensive, with the United States Army providing several UH-1 Huey attack helicopters and a C-7 Caribou light transport. The United States Air Force supplied two C-130 Hercules transports and two A-1 Skyraider attack aircraft as well as film footage of an AC-47 Puff the Magic Dragon gunship and an HC-130 Hercules employing the Skyhook Fulton recovery system for use in the film. The Army also provided authentic uniforms for use by the actors, including the OG-107 green and "Tiger Stripe" Tropical Combat Uniform (jungle fatigues), with correct Vietnam War subdued insignia and name tapes. Colonel Lamar Asbury "Bill" Welch, the actual commander of the United States Army Airborne School at Fort Benning in 1967, makes a brief cameo shooting trap with John Wayne. Welch wears a 1960s US Army Fatigue Baseball Cap (common issue during the Vietnam War) in the scene while the actors wear green berets. Soldiers exercising on the drill field - that Wayne shouts to - were actual Army airborne recruits in training. The film's large set-piece battle is loosely based on the Battle of Nam Dong on 5–6 July 1964 when two Viet Cong battalions and the PAVN attacked a CIDG camp at Nam Dong near the Laotian border in South Vietnam's Central Highlands. For five hours, a mixed force of Americans, Australians and South Vietnamese troops fought off a force three times its size. The movie camp set, which was constructed on an isolated hill within Fort Benning, had barbed wire trenches, punji sticks, sandbagged bunkers, mortar pits, towers, support buildings and hooches. Several tons of dynamite and black powder were then used to largely destroy the set during the filming of the battle sequence. Other realistic "Vietnamese village" sets were left intact after the shooting ended so they could be reused by the Army for training troops destined for South East Asia. The original choice for scoring the film, Elmer Bernstein, a friend and frequent collaborator with John Wayne, turned the assignment down due to his political beliefs. As a second choice, the producers contacted Miklós Rózsa then in Rome. When asked to do The Green Berets for John Wayne, Rózsa replied: "I don't do Westerns". Rózsa was told "It's not a Western, it's an 'Eastern'". As a title song, the producers used a Ken Darby choral arrangement of Barry Sadler's 1966 hit song Ballad of the Green Berets, which had been co-written by Robin Moore, author of the original Green Berets novel. Rózsa provided a strong and varied musical score including a night club vocal by a Vietnamese singer Bạch Yến; however, bits of Onward Christian Soldiers were deleted from the final film. Upon its cinema release, movie critic Roger Ebert gave it zero stars and cited extensive use of cliches, depicting the war in terms of "cowboys and Indians", and being a "heavy-handed, remarkably old-fashioned film." It is on his "Most Hated" list. Reviewing for The New York Times, Renata Adler wrote, "The Green Berets is a film so unspeakable, so stupid, so rotten and false in every detail that it passes through being fun, through being funny, through being camp, through everything and becomes an invitation to grieve, not for our soldiers or for Vietnam (the film could not be more false or do a greater disservice to either of them), but for what has happened to the fantasy-making apparatus in this country." The screenplay for Oliver Stone's anti-war film Platoon was written partially as a reaction to The Green Berets. It is mocked in the Gustav Hasford novel The Short-Timers in a scene where Joker and Rafter Man find the Lusthog Squad watching it at a movie theater. "The audience of Marines roars with laughter. This is the funniest movie we have seen in a long time." The journalist and left-wing activist John Pilger, a strong critic of American foreign policy, described his reaction to The Green Berets in a 2007 speech he gave criticising the media for its coverage of the Vietnam war. "I had just come back from Vietnam, and I couldn’t believe how absurd this movie was. So I laughed out loud, and I laughed and laughed. And it wasn’t long before the atmosphere around me grew very cold. My companion, who had been a Freedom Rider in the South, said, 'Let’s get the hell out of here and run like hell.'" Film commentator Emanuel Levy noted in his review that Wayne was not attempting to promote the cause of the Vietnam War as much as he was trying to portray the Special Forces in their unique role in the military: "Wayne said his motive was to glorify American soldiers as the finest fighting men 'without going into why we are there, or if they should be there.' His 'compulsion' to do the movie was based on his pride of the Special Forces, determined to show 'what a magnificent job this still little-known branch of service is doing.' ... 'I wasn't trying to send a message out to anybody,' he reasoned, 'or debating whether it is right or wrong for the United States to be in this war.'" Levy also notes that Wayne acknowledged that war is generally not popular, but the soldiers who serve face the risks and dangers of combat nonetheless, and must be prepared to sacrifice themselves, regardless of their personal will or judgment. Levy quotes Wayne: "What war was ever popular for God's sake? Those men don't want to be in Vietnam any more than anyone else. Once you go over there, you won't be middle-of-the-road." Despite the poor reviews, and despite being protested and picketed in the United States and abroad, it went on to be a commercial success, which Wayne attributed in part to the negative reviews from the press, which he saw as representing criticism of the war rather than the film. "The critics overkilled me, the picture and the war," said Wayne. "As a result, so many people went to see it that I had a check from the distributors for $8 million within three months. That's the cost of the picture, so we moved into profit the next day." The Green Berets earned rentals of $8.7 million in North America during 1968. ^ "The Green Berets, Box Office Information". The Numbers. Retrieved May 23, 2012. ^ a b Moore, Robin Introduction to 1999 edition The Green Berets The Green Berets: The Amazing Story of the U.S. Army's Elite Special Forces Unit 2007 Skyhorse Publishing Inc.
^ a b Ebert, Roger (June 26, 1968). "The Green Berets". rogerebert.com. ^ a b Adler, Renata (June 20, 1968). "Screen: 'Green Berets' as Viewed by John Wayne: War Movie Arrives at the Warner Theater". The New York Times. ^ Suid, Laurence H. (2002), Guts and Glory: The Making of the American Military Image in Film (Rev. and expanded ed. ), Lexington: University of Kentucky Press, p. 247, ISBN 0-8131-2225-2 . ^ Moore, Robin. The Green Berets (New York: Crown Publishing), 1965. ^ "Col. Lamar Asbury "Bill" Welch". www.findagrave.com. Retrieved May 30, 2017. ^ Pilger, John. "Freedom Next Time: Resisting the Empire". Speech. Democracy Now. Archived from the original on 2013-07-28. ^ Levy, Emanuel (January 29, 2006). "Green Berets (1968): Vietnam War as Seen by John Wayne as Director and Star". emanuellevy.com. ^ "Wayne's 'Green Berets' Is A Big Money-Maker". The Miami News. 6 January 1969. p. 5-B. ^ DUKE Los Angeles Times (1923-Current File) (Los Angeles, Calif.) 25 January 1970: n6. ^ "Big Rental Films of 1968", Variety, 8 January 1969 p 15. This figure is a rental accruing to distributors.